A dignified aura of its rich past cloaks every corner of Aurangabad, a bustling city in Maharashtra. The crowning minarets that dot the city landscape and the villages around it, dissolve into the mist of history as the lavender of the evening glow envelopes the monuments from which writers extract magical romances for their books. Legends abound of the great kings and saints who once inhabited this land. The ravages of time and the passages of history have slowly driven the chapters of glory into bygone memories. But, in the narrow lanes of Aurangabad, a splendid tradition— of the intricately woven fabric called himroo–still struggles to survive. Enduring the driftwood of history , it is now relived in the houses of narrow lanes, where against the click-clack of the looms, families weave exquisite varieties of this fabric. This art, originated in Persia and inspired by Persian designs, has a very distinctive appearance to it. The weaves incorporate plain lines woven in different geometrical designs and patterns with the motif designs drawn from nature, portraits of rulers and religious verses from the Qur’an as well as from the Hindu mythology. The popular motifs consist of ‘SiaJangla’ that has hanging creepers with flowers and foliage mixed up with miniature cones, Ajanta pattern inspired from Ajanta Caves and Ambi pattern where paisley motif dominates fabric. Other designs include local fruits, animals, flowers and birds. The actual ornamental design is formed on the principle of extra weft figuring. Because of this extra layer of loose silk weft, himroo shawls are soft and almost feel like silk. The word himroo originated from a Persian word hum-ruh which means ‘similar’. It was developed as a cheaper alternative to kimkhwab, the more lavish brocade of silk and gold thread weaved for royalty in the 14th century. Most of the himroo shawls and saris today are mass-produced using power looms but some showrooms in the city still source from traditional workshops, thereby preserving this dying art. Himroo weaving is said to have been brought to Devagiri (present day Aurangabad) during Mohammad Bin Tughlaq’s reign. He renamed Devagiri as Daulatabad and shifted the capital from Delhi to Daulatabad in 1326. He insisted that all industries should also be shifted to the new capital. A number of craftsmen relocated to Daulatabad and established the first industry in the city Tughlaq’s experiment gradually failed and the capital was shifted back to Delhi in 1335. However, by then the himroo weavers had struck frim roots in Daulatabad and opted to stay back. The last Mughal emperor Aurangzeb also made the city his capital from 1653 to 1707. With the emperor’s death came the city’s rapid decline, but the brief period of his empire saw the blossoming of the himroo industry. Members of the royal family and the elite lavished their courts and houses with himroo. Silk fabrics became the chief revenue generator for the town which became known across the world for its hand-woven fabrics. in 1673 a Persian ambassador who was returning to Iran from the court of Qutub Shahi king was presented with a precious piece of himroo which took five years to be completed by the master craftsmen. The fabric earned glowing tributes from foreign travellers and diplomats who visited India. Marco Polo referred to himroo as the finest cloth in Deccan. He also said that kings and queens of any country in the world will take pride in wearing it. The base of the fabric is usually woven with cotton or wool, and designs on it are of silk. Besides shawls and saris, the other products woven out of himroo include coats, jackets, skirts, bed sheets, pillowcases, curtains and other furnishings. Himroo sherwanis (long coats) were once very popular among the menfolk. During the Nizam’s period, sherwanis made of himroo became so popular that they were considered an intrinsic part of the wedding attire of the groom. Till the mid-twentieth century, a steady demand from the Nizam’s court in Hyderabad kept the himroo weavers busy. The Nizam used it to adorn the silhouette of his sherwani and soon, the fabric was a must-have piece in the wardrobes of the nawabs of Deccan. With the exigencies arising from the Second World War and later as the Nizam’s court faded away from political power, there was a drastic decline in the demand for himroo. The number of looms and families involved in himroo weaving decreased significantly. The new consumers who mostly belonged to the middle classes could not afford the expensive and gorgeous cloth while tastes of consumers also underwent a change . Much credit for keeping the craft alive in the past goes to the Qureshi family from Aurangabad who undertook a rejuvenation drive a century ago during the time of the Nizam of Hyderabad. Ajaz Ahmed Qureshi, who represents the 13th generation of famous Qureshi family, currently runs the Aurangabad Himroo Industry and the Paithani Weaving and Training Centre at Jaffer Gate, Mondha Road, in Aurangabad. Both are Government of India undertakings. The government sponsors the looms for the work and runs training programmes for weavers. Ajaz Qureshi, who learnt the job from his father, is a master craftsman himself. Upon visiting the training centre, which appears to be one of the last repositories of this dying craft you can see the nimble fingers of weavers gently toss the katla (thread shuttle) left to right, their legs moving the paddle of the traditional wooden loom downward to weave the himroo motifs on the silk base. The captivating motifs appear on the surface in brilliant blue, black, orange, yellow and ochre. There was a period when more than 800 looms flourished in Aurangabad; today hardly few remain, the number continuously dwindling with time. The situation would have been worse had the Qureshi family not made vigorous efforts to keep it alive. Professional and vocational training is acquired within the family milieu which restricts social mobility and access to modern technology. 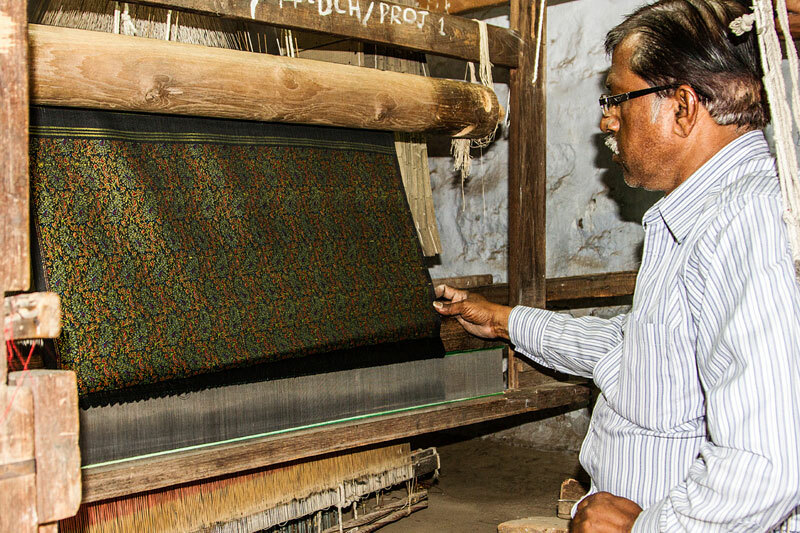 With basic training, modernized tools and equipment as well as meticulous planning, Aurangabad’s weavers too can diversify and reclaim the market. However, a true lover of the art continues to insist on the woven magic created by human hands. This one aspect of Indian heritage, if ethically, honestly and well managed could lift us to the status of a superpower more than information technology can; because it is unique, it is Indian. IT can and is done by anyone anywhere.